The Emergency Services College has developed simulation teaching and related virtual operating environments to promote learning of rescue operation command skills. The environment comprises different types of devices and software components. 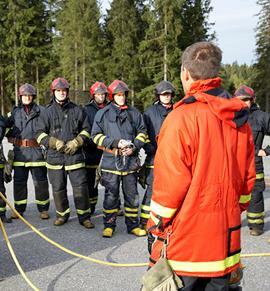 The Finnish authority communications network or a simulated network used by authorities as well as different types of IT application are used for communications to assist command in matters such as maintaining and sharing situation awareness. IT is used in the planning of exercises as well as when the exercises are carried out to simulate realistic accidents. Simulation-assisted education can help increase education and training motivation and establish sufficient immersion in leaners. The use of Emergency Services College’s emergency medical care and emergency response centre simulators as part of command exercises increases interaction with the teaching staff and promotes pedagogical discussion. Also, interaction between educational institutions and authorities can be increased and new pedagogical alternatives can be found for the training of joint operations. A networked simulation exercise can be carried out by sharing the joint operation exercise and the related simulations online. In this way, a real-time exercise can be performed with all the joint operation participants regardless of their location. The use of the Finnish authority communications network for communication is not tied to a certain location and the use of the Internet reduces the need for travel. The participation threshold has been lowered as participants can now take part in the exercises from their own locations. Exercises can be small with regard to realisation of costs and light in structure, and they may focus on more effective collaboration between commanders of rescue operations and staff in order to resolve accident situations that are current or considered important. Costs are smaller because these exercises do not require the movement of vehicles or crew. This learning environment can be used in accident prevention and safety training exercises, and these can also be made interactive. It also provides an effective testing environment for research and development use. However, simulation-assisted learning does not eliminate the need for organising joint operational exercises where all participants are physically in the same location. Command situations are operatively demanding and expertise is evaluated in many ways.